This is one of those tests you run into if you apply for a job online. It is a series of statements followed by the multiple choice answers, “Agree, Disagree, Strongly Agree, or Strongly Disagree.” Well! This got me thinking about what a test for a good bird caregiver would look like. So I devised my own. It’s a tongue in cheek test simply for fun to acknowledge the feelings of frustration, confusion and minor irritations Parrot Caregivers deal with every day. I’m a huge believer in allowing for the frustrations as well as the gratification, amusement and comfort our birds give us. You simply can’t have one without recognizing the other. It’s a tough road we chose. But only by recognizing the sheer work and force of will it sometimes takes to deal with them day after day can we recognize and take pride in the good things that happen as a result of our work. And if we have a sense of humor about it, all the better! I call this test the “Uni’too Parrot Household Personality Inventory.” If you’d like to take it, I’m sure you will all triumph with the position of “Parrot Household Caregiver” offered to you, but only, and I say only mind you, if you are perfectly honest. If you lie, you will flunk and have to suffer the shame of knowing you lied your keester off in order to get the position. While lying works with the Unicru test, it will throw you right into the ditch here. But to make it easier, I have provided clues that will give you an idea of how you might feel about each answer. It’s a short test, but deadly in its accuracy. 1.) 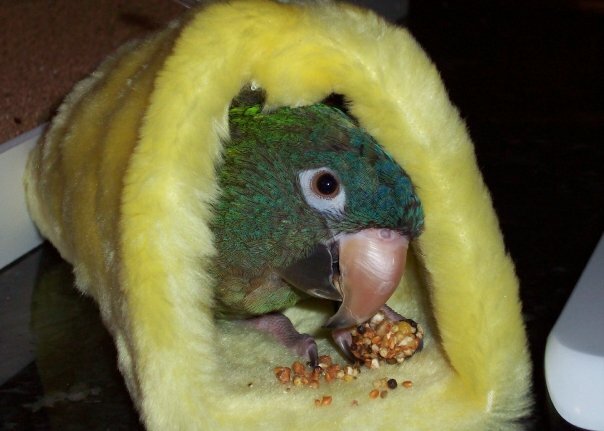 When your parrot refuses to come out of his cage, throws his cooked pumpkin on your brand new dress pants, bites off a newly manicured nail and takes a crap on your semi-expensive oriental rug after having eaten spaghetti sauce, you ignore it. 2.) You love to listen to your parrots go on a rant for about four hours screaming at the top of their little leather lungs. 3.) You swear when you argue with your parrots. 4.) You have sometimes thought seriously about just finding your birds new homes. 5.) Despite everything, the mess, the noise, the destruction, the wreckage, the insane workload, and the insanity, I’m a better person because of those little criminals. There is no answer key. I’ll just let the test speak for itself. Parrot Nation starts my day better than a cup of coffee. Whooda thunk? Aww, thanks Irena! I just hope people recognize the fact that this is all in in good fun. It’s just a snarky column meant to acknowledge our darkest moments. But the good thing is, we simply trudge on. LOL……. always gets a smile on my face at Parrot Nation. The test is so funny. I think I had many answers! Debbie, it was meant to make you smile and feel good that everyone gets frustrated. By recognizing that, we can laugh at ourselves and get back to the business of caring for our birds! 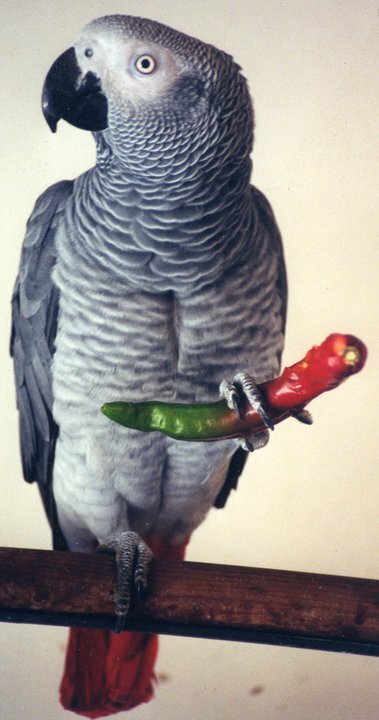 Well I think EVERYONE knows how I feel about my parrots – love them like no other. Love me, love my parrots. 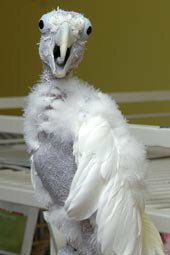 Virginia, you are the consummate parrot caregiver. I think we all feel the same way. I wish more people felt the way you did. I know of a woman who went through hell when her husband left her due to her flock. She let him go. I think she made the right choice. I think she made the correct choice as well. I ended a relationship for the same reason – we did not see eye to eye about my birds. He said all sorts of things putting my love for my flock down but I just put my foot down and said it is my way or the highway – he hit the highway. They will always come first in my life! I have 3 Scarlets. Scar is the first part of their name…although I don’t see snuggle anywhere in there and that’s part of it too. Best thing I ever did was share my life with them. Earplugs are occasionally a nice thing to have. The post was a humorous comment about what we all occasionally go through with our birds. Snuggling is just wonderful and I think it’s therapeutic for both birds and humans alike. But this wasn’t about that, I guess. It was just a fun post meant in good humor, that’s all. I like the the 4th answer to number 4! ha ha. They are messy, noisy, expensive, time consuming and to top it off, they bite….but cannot imagine my life without them!! Me neither Mary, me neither! Thanks for the laughs ( chortle chortle! ), Patricia! I needed this today! Glad to do it Peggy! I think we all need to laugh at ourselves once in a while. My flat is shared with the worst kind of flat sharers ever – A Cockatoo, A Grey, and three cockatiels, who throw their food on the floor and their toilet manners are something to be desired…not. But I wouldn’t have it any other way, of course. We can all relate to that. I don’t think any of us would have it any other way. That was GREAT!!! Thanks for the laugh. And for acknowledging that even though we absolutely love and adore our birds, we also get frustrated with them. And that’s OK! I have this weekend off if you want to do lunch. You’re welcome for that laugh. So many people forget to mention how frustrating it is to have birds sometimes. I don’t forget. Lunch actually sounds terrific! Is “personality inventory” code for “parrot induced insanity”? Thanks for the laugh! I think the “Inventory” part is where you do an inventory of your own sanity and realize as you are going through that big empty closet of your sanity, that you have none left! And standing right in the middle are all of your parrots beckoning you to join them! Weird part is, we always do! And we do it happily! OMG! That was hilarious and allowed me to be truthful to myself. Patricia, you’re like the bird slaves psychiatrist! I REALLY needed this! Thank you! Lynne, you’re welcome. I think the more honest we are about how we feel, the healthier we are. Admitting that they drive us nuts is the first step to a better relationship with them. At least that’s how I feel. All of a sudden there are people finally admitting that at times, their birds drive them insane. And I think that’s perfectly normal. Talking about it makes us realize we’re not alone. We’re not the lone freak who sometimes gets so upset with their birds behavior that they want to give up. Problem is, most people won’t admit this. Consequently, they think nobody else has these issues. My G-d, what a talent you are! This was the best morning wakeup ever! Takes me back to all the little frustrations and occurances there have been over the years! Adolph (TAG) screaming “get outa here!” at a repairman and scaring the crap out of him! Jackie, thank you! I wouldn’t have it any other way either. But as I’ve said, this is an honest, yet humorous look at how we sometimes feel. I’m not saying I would ever do any of those things, I think I made that clear. But let’s be honest here…Occasionally they make us crazy! This post reminds me of the one thing that frustrates me about my bird, Stormy (TAG). I cannot even leave the room without her screaming at me until I get back. Often I have to take her with me from room to room, even if I am gone less than 5 minutes. I always tell myself that this is what she would do to her mate in the wild when they were out of her sight and she does it because she loves me too. Since she’s just a baby (8 months old), she still doesn’t understand “Be Right Back”, but until she does, I have to be patient. When you love birds like you and I do, it’s not work, but love intaking care of them! Tom and I love our Redlored Amazon parrot, Ginger very much! She has been with us nearly 23 years! 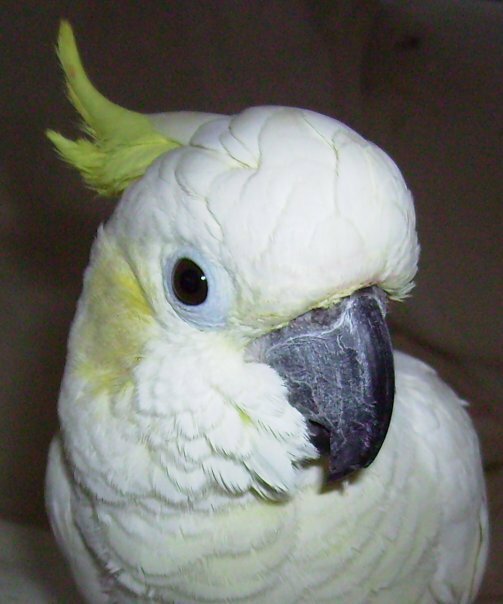 After we move to Florida, and get settled in, we are considering adopting a rescue bird. Ginger is our feathered angel! Loved the test! It really made me giggle as I glanced at the big hole in my new blinds !!!!!! My home would not be a home without my flock. Even my 2 dogs have come to realize that if you sit under the jungle ropes, you’re gonna have fur full of poo. 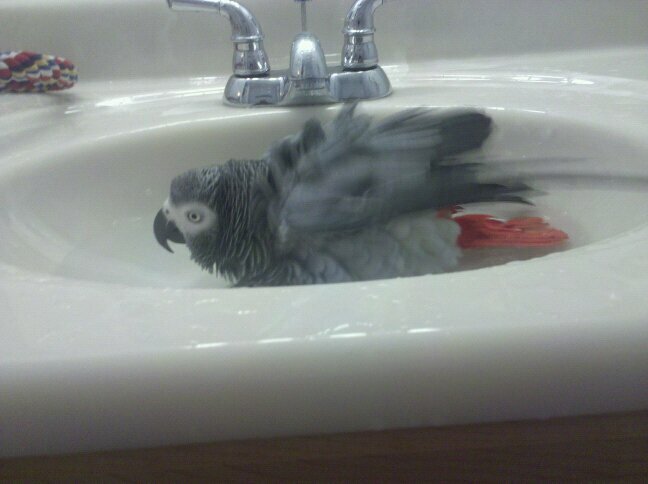 Ladies, try the toilet manners of many conure species. Clean up on aisle 5 isn’t a start! Love the fids. They are mine until God asks for them back. Hope you had a great Hatchday, Patricia. This was ever better than your Memo to Pepper, Parker and Nyla! Of course it is…I’m not being edited here. My blog, my point of view, When you write for someone else, you kind of have to reign it in.